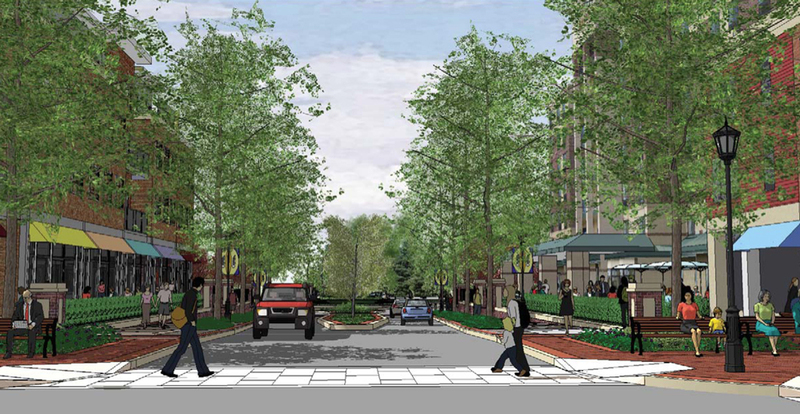 In an effort to revitalize a blighted downtown and a deteriorating residential area that borders Rowan University’s campus, the Borough of Glassboro adopted the Rowan Boulevard project. The Boulevard will replace the residential area and connect Rowan’s campus to Glassboro’s central business district, with the goal of turning the downtown into the first “town and gown” destination in South Jersey. The plan employs an array of smart growth principles: creating a sense of place, embracing private investors, utilizing existing infrastructure and resources, preserving and creating open space, increasing residential and commercial opportunities, as well as strengthening the economy of the community through mixed land use. The plan is an outstanding example of what a community can do to restore its commercial core, enhance existing assets and create a walkable downtown where people live, work, shop and dine. The project minimizes vehicular traffic and encourages mutual use of space by office workers, shoppers, residents, students and visitors without creating sprawl. To implement the plan, the borough acquired approximately 92 properties — including rental units with many code violations, owner-occupied houses, empty lots full of trash and half a dozen commercial properties that had sat vacant for many years — located in a 26-acre corridor between the Rowan campus and the downtown business district. The new Rowan Boulevard transforms this area by connecting the Rowan campus with Glassboro’s downtown, bringing with it as much as 500 market-rate residential housing units and possibly more than 200,000 square feet of new retail and office space, as well as more than $1 million in annual tax revenue. In addition to the Boulevard, the first phase of the redevelopment plan includes construction of housing for approximately 884 Rowan students. Developed and managed by SORA Holdings, a private developer, this project (unlike university-owned housing) will generate additional property tax revenue for the borough. Construction of the student housing unit started in September 2008 and is scheduled to be completed by the start of the fall 2009 academic term. Also part of the plan is a 107-room hotel/conference center, to be built at the corner of Route 322 and the Boulevard, which is designed to provide a seamless transition from the campus to the downtown business area. Construction is expected to begin in the fall of 2009. Rowan Boulevard will be lined with mixed-use buildings featuring retail on the first floor and either commercial or residential units on the upper levels, creating a walkable community for residents, students and business owners. To help increase residential and commercial opportunities, Rowan Boulevard will be lined with mixed-use buildings featuring retail on the first floor and either commercial or residential units on the upper levels, creating a walkable community for residents, students and business owners. Concerns about safety are addressed by incorporating principles of Crime Prevention through Environmental Design (CPTED) into the project, aimed at attracting residents, office workers and university students to the downtown — adding “eyes” and “feet” to the street. In addition to the Boulevard project, Glassboro has enhanced its master plan for overall downtown redevelopment — adding a town square for additional green space, relocating the county library branch to one end of the new Boulevard and developing a localized trolley system to move people between parking areas, the Rowan campus and shopping and dining opportunities within the downtown. The enhanced master plan now includes a 1.4-acre town square park at the corner of Rowan Boulevard, Main and High streets, and a larger library incorporated in the design. The borough, in partnership with the university, has submitted the Rowan Boulevard plan for certification as a LEED ND pilot project through the U.S. Green Building Council, based on the fact that SORA Holdings is incorporating “green” standards in its plans. Supporting Partners in the project are: CRDA; DVRPC; Kitchen & Associates Architectural Services; and NJ DOT.